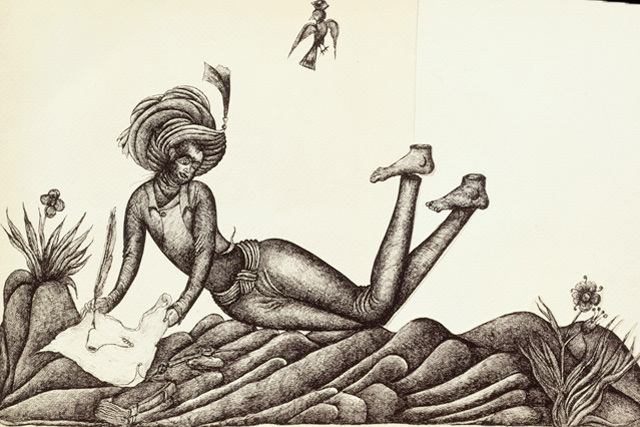 rdeshir Mohassess was born in Iran in 1938 and began drawing early in his childhood. He was a self-taught caricaturist and graphic artist whose drawings express the ironic and absurd in the human condition as witnessed both before and after the Iranian Revolution in 1979. In the 1960s, after receiving a degree in political science from Tehran University, he worked as an illustrator for Iranian journals and newspapers. Soon after, his drawings began to appear in major international newspapers and magazines, including The New York Times. In 1976, Mohassess left Iran for what he planned as a temporary stay in the United States. However, with the outbreak of the Iranian Revolution in 1979, Mohassess chose to remain in New York. This exhibition was the first retrospective of Mohassess’s work to be presented in the United States. It brought together nearly 100 rarely-seen monochromatic ink drawings by Mohassess from the Library of Congress in Washington, D.C. and from several private collections also in the United States. Since the 1960s, his elaborate tableaux as well as his simple, raw drawings for newspapers and magazines have been exhibited internationally and are celebrated for providing a unique insight into Iranian history and contemporary culture. The drawings on display were created between 1976 and 2000 and reveal his focus on the conflicts between the oppressor and the oppressed both before and after the Revolution of 1979. Mohassess’s work was informed not only by the complexities of modern history and politics, but also by traditional Persian arts and culture. Throughout his career, Mohassess has remained a resolute social critic, focusing on the cruelty, humor, and vulnerability of human nature. Acclaimed artists Shirin Neshat and Nicky Nodjoumi were guest curators of the exhibition.